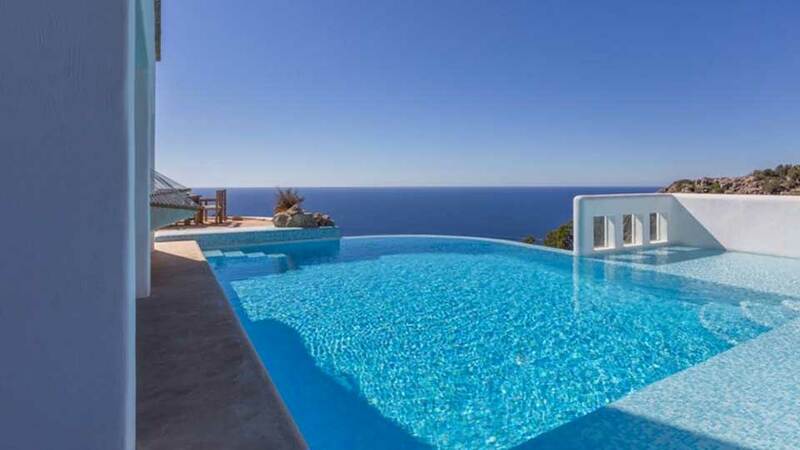 Modern 3 storey house located in Na Xamena, near the Port of San Miguel. Corner quite isolated from everything, but very preserved and calm. Room, 1st floor, view of the sea. This bedroom has 1 double bed 180 cm. Bathroom ensuite, With shower. This bedroom includes also air conditioning. Room, 1st floor, view of the mountains. This bedroom has 1 double bed 160 cm. Bathroom ensuite, With shower. This bedroom includes also air conditioning. Room, 1st floor, view of the sea. This bedroom has 1 double bed 180 cm. Bathroom ensuite, With bathtub, shower. This bedroom includes also air conditioning, TV, private terrace. Room, Lower floor, connecting room. This bedroom has 1 double bed. Bathroom ensuite, With shower. Parking and main entrance to the villa. Modern well equipped open kitchen with fridge, gas stove, oven, Nespresso coffee machine, kettle, blender, toaster and dishwasher. Room equipped with washing machine, dryer, iron and ironing board, another small refrigerator, and maintenance equipment. Very large living room with a large wooden table that can accommodate 8 people. 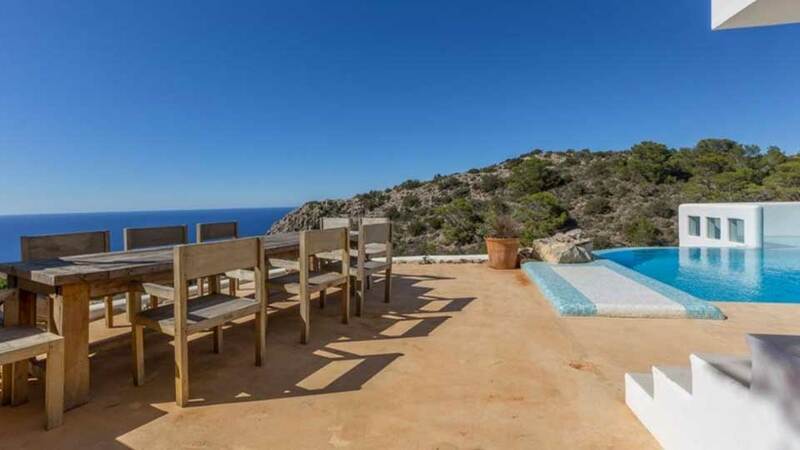 Terrace with comfortable sofas and cushions next to the pool with stunning views of the mountains and the sea. Spacious terrace with portable barbecue (charcoal) and a wooden table for 10 people. 10x10 aprox. Private rounded pool that includes a shallow area to enjoy the sunset. Overflowing swimming pool. Located 15 minutes drive from the village of San Miguel, and 10 minutes from the beach of San Miguel. 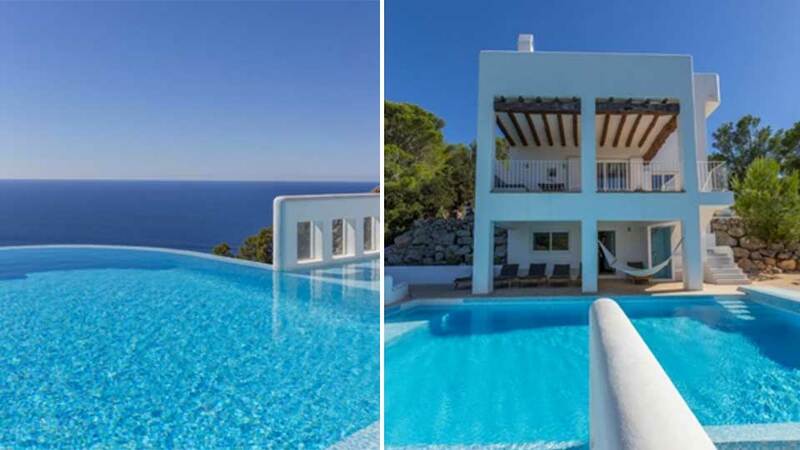 And 15 minutes drive from the beach of Cala Benirràs and Cala Xarraca. 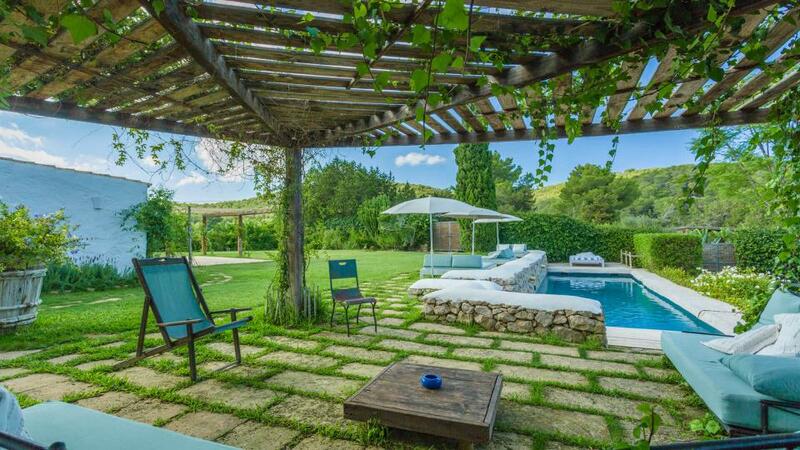 The village of Santa Gertrudis is 20 minutes away and Ibiza Town is 30 minutes away.